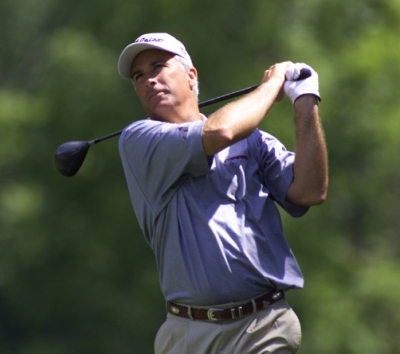 MOREHEAD CITY, NC � Times are a changin� for Curtis Strange. Virginia�s two-time US Open Champion and recent US Ryder Cup Captain admits he was ready for a change, and the past year has certainly brought that about. When we last talked with Strange about a year ago (January, 2004), he indicated that he was trying to decide on whether to play full-time on the Champions Tour, or commit to several more years in the broadcast booth for ABC TV � and still play some on the Tour, once he turned fifty in January of 2005. The date has come and gone, and Strange made the decision to do what he�s always done � play golf. It was a difficult choice, but for someone so accomplished in his profession, in the end the lure of the game was too much, and he�s now committed to playing the senior circuit, along with the likes of recently-turned-fifty players Craig Stadler and Peter Jacobsen. He�s also moved out of the Old Dominion. Long having lived at Kingsmill in Williamsburg, Curtis and his wife have now relocated to coastal North Carolina. Strange�s early season results haven�t matched his expectations, but with some work on his short-game and getting accustomed to playing with the senior players, he�ll certainly find his place in his new Tour home. GTMA: Unlike in previous years, we haven�t been seeing (or hearing) you much since you left ABC TV last season. What have you been up to, and what are your plans? Strange: Well, ever since I resigned from ABC last May, I�ve kind of changed courses and started playing golf again. I took last summer off and started practicing, and just got back into the mindset of playing competitively again. It was something that I didn�t think that I would do full-time again, playing golf. I thought I was going to be involved in television for at least awhile. GTMA: Why did you decide to stop doing TV? Strange: My contract with ABC went until January of �05, when I turned fifty. Meanwhile, there were two more years left on the current TV deal with the PGA Tour, and the network wanted me to commit for those, which essentially meant I�d be working the booth the same way I had for all these years, and I wouldn�t be able to devote a lot of time to practicing and playing. I thought about it and thought about it, and I said �Yeah, I�ll do that.� I didn�t know if I wanted to beat my head against the wall playing golf again� but I needed a guaranteed commitment in return from ABC. If I was going to give up my first two years on the Champions Tour to ABC, I wanted a commitment back for the next TV contract � if they were going to continue with golf. They somewhat agreed to that, then a new producer came in and took it off the table. So I just went about my business. GTMA: Is it impossible to play and man the booth in the same season? Strange: You can�t do both and play well. Playing enhances your knowledge and ability to do TV, I think, and it gives you a lot of credibility when people know you�re still out there, and current. But when you�re playing, you have to give twenty-four hours a day, everyday of the year � if you�re really going to try and do well. Everybody moves on. I knew, when I started doing TV, I was ready to do something else. You get frustrated with your own game and you get to that age where, you�re kind of in a no man�s zone � from somewhere in your forties to fifty, when you�re eligible for the Champions Tour. Doing TV is an interesting opportunity for some players, so if you�re ready for a change, it�s great to give it a shot. But it also means that your playing career will suffer. GTMA: Do you miss doing TV? Strange: I did for awhile, because it was such a big part of my life for eight years. Once I got over the not playing part of it for the first two or three years of doing TV, I was resigned to the fact that this is what I was going to do. I particularly miss the people I became very, very good friends with, like Judy (Rankin), Mike (Tirico) and several of the others. And we still talk every couple of weeks. But I just set my sights on playing again, and went from there. I�ll just say that everything works out for the best. I thoroughly enjoy playing competitive golf. I don�t enjoy playing the way I�ve played so far (his best finish to date is a tie for 31st in late February), but the playing part is what I know and what I can control. And it�s what I�ve always done. GTMA: Now filling your role at ABC is the duo Nick Faldo and Paul Azinger � kind of an odd choice of personalities to fill the void, but it seems to work. What are your thoughts on that? Strange: I think Nick Faldo doing TV is very interesting. I think he�s good, and I think he�ll get better. Personally, I think the American public is intrigued by Nick because he just never said anything before, and they�re interested to see him and hear what he has to say. They�ve known the quiet competitor, but now they�re discovering that he�s got an interesting personality to go along with that. GTMA: He�s a little �off the wall,� but he�s entertaining, that�s for sure. Strange: And that�s good. When you do TV, you have to go in there with some different elements � some arrogance � you assume that people want to hear what you have to say. And you�ve got to kind of not care, because there�s always going to be someone who�ll want it done differently. If they don�t like you, they don�t like you � and that makes you good. It makes you off the cuff, relaxed and casual and talking golf. As far as pairing Nick with Paul, I also think that�s intrigued the public a little bit, because the public knows that haven�t gotten along over the years (Ed note: Prior to working together at ABC, Azinger and Faldo hadn�t spoken in twelve years). Sometimes that type of chemistry can backfire � but so far, I think they�ve been a good team. The glue that holds all the people together at ABC is Mike Tirico (ABC�s host for its golf telecasts). He works very hard at making these guys look good � and you can�t give him enough credit. From experience, the host does a lot of the babysitting of the announcers. GTMA: We can probably guess, but why didn�t they get along? Strange: It all stemmed from the Ryder Cup. And, you know, Nick wasn�t exactly the most liked person when he was playing because he just didn�t say anything. GTMA: Paul�s also reaching the age where he�d be considered for captaining a US Ryder Cup Team. 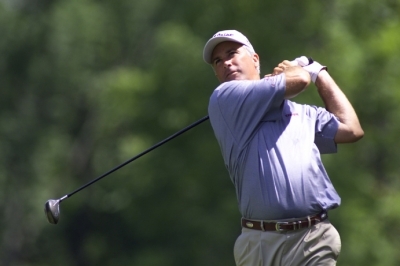 Obviously Tom Lehman�s coming up next year, but how about for the Cup in �08? Strange: I�m not in the loop as far as that�s concerned, but as an outsider looking in, I�d say he�s a wonderful prospect to be captain. There�s no guarantee, but I think everybody looks at Paul as having all the ingredients to be a good one. Curtis Strange at the Grand Re-Opening of Bide-A-Wee Golf Course in Portsmouth, which he helped design along with Tom Clark of Ault, Clark & Associates. I�d be surprised if one day he wasn�t selected. GTMA: If it�s for 2008, he�d captain against Nick, who�s already been tabbed for the European squad. Maybe ABC TV had a bit of foresight in choosing the combination? Strange: The press would love that, and it makes for a good story. GTMA: Now that we�re on the subject of captains � as a former captain yourself, do you have any thoughts on last year�s Ryder Cup and what Hal Sutton was going through? Strange: As far as Hal�s concerned, you do the best job that you can. On paper, what happened just doesn�t make any sense. And when I say on paper, you�re talking about major championships and things like the World Golf Championships and other big events, when all of their team plays and all of our potential team players are there � and they play in a stroke play tournament. We are, on paper, better players. That�s just a fact. But then, here comes the Ryder Cup, and I think that the Europeans have proven they want it more � which is a huge ingredient in sports. And they have proven that they�re better match play players. Without a doubt. The problem is � we all try to dissect it and figure it out � but when your four best players, Tiger Woods, Phil Mickelson, Davis Love III and Jim Furyk � all have losing records in a Ryder Cup, you�re not going to beat anybody. And they continue to have losing records. And I don�t know what the solution is. I think, what I keep saying, is pride has to become a major factor eventually. But if they don�t play hard in Ireland, they�re going to get their butts beat there, too � because in Ireland, it�ll be tough to play. They�re finally bringing the Ryder Cup to Ireland, with tremendous, tremendous golf fans. And it�s going to be hard to play there. GTMA: Yes indeed. Why do the Europeans just seem to want it more? Strange: Because they grew up with the Ryder Cup on their radar screen. From day one, every European boy has two things he dreams about, as far as golf is concerned � the British Open and the Ryder Cup. That�s how big it is over there. For us, the Ryder Cup � it wasn�t even on our radar screen until 1987, when they beat us over here (at Muirfield Village in Ohio, the first time the US team lost on American soil). Strange correctly predicted that one of the 'big four' would win the Masters. Here, it's Tiger Woods. Photo by David Vier. So, we haven�t had a generation of kids growing up and thinking about the Ryder Cup on the same level as the four major championships. Here in the US, our focus has been on the four majors, and now, to some extent, money. And so, the Ryder Cup wasn�t a big deal until recently. 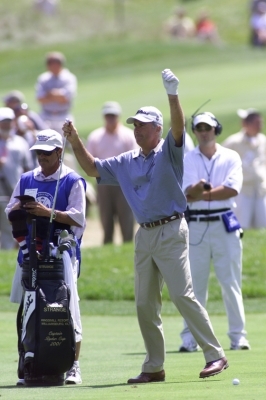 It was always a big deal to the players � it was always a wonderful week, and the PGA of America does a fantastic job of putting it on, and they couldn�t treat the players any better. But the Ryder Cup wasn�t� it�s just not the same. GTMA: Okay, so they�ve grown up with it, but why better match players? Strange: I don�t know. I mean, they don�t play any more match play than we do. That�s a crock when you read that in the press. Now, does their camaraderie enter the picture? Yes. Maybe they�re a little more team or partner oriented because their Tour is run so much differently. It�s not that we�re distant from each other, playing on the US Tour... It�s the environment. Think about this. We all have our different ways of traveling, and I don�t care what it is � when we go to a tournament, there�re six or eight different hotels you can stay in. Then there�s umpteen restaurants you can go eat at. There�s room service. There�s everything, so the players do scatter more over here. Plus, our families travel with us a lot, so that dictates where you go to eat and stay and things like that. Think about that. Now, when you go and play on the European Tour -- and I don�t mean this as being critical � they�ll go to an out-of-the-way place, or they�ll go to Paris. But all the players stay in one hotel, because there�s only one hotel that�s near the golf course. And there�s one restaurant in that hotel. They all eat and stay together, too. When they travel, everything goes through London. So, they travel together, they stay together, they eat together. And it�s a different environment. So think about it like that, and it makes a helluva lotta sense, how they might have a different feeling when teaming up for match play. GTMA: Plus, they have a number of players who just seem to turn it up a notch in the heat of that particular competition � Colin Montgomerie comes to mind. Strange: Yeah, ain�t it something? First of all, from an athlete�s perspective, from a player�s perspective, it�s neat to see something like what he�s done. I don�t care what side a player�s playing for, it�s neat to see somebody rise to the occasion like that. Any sport, it�s neat to see somebody rise and do something. To see Colin and what he did against Scott Hoch in my Ryder Cup, or to do what he did last year � and to see any of those young kids play so well� it�s pretty neat. GTMA: Why do you think there�s such a discrepancy between the way our top US players perform in the Ryder Cup and the President�s Cup? Strange: Well, the International team is in the same situation as us � they come from different places and most of them play on the US Tour, so there isn�t the same sort of camaraderie amongst the players as there is with the Europeans. Plus, I don�t think either team takes the President�s Cup nearly as seriously as the Ryder Cup. GTMA: David Feherty said it�s the US Team against a bunch of guys who live in Orlando. And that brings me to another point on the Ryder Cup, and why our top four players might have losing records � this �format� has gotten old for them. When they started playing the President�s Cup and the Ryder Cup in alternating years, these guys have to play in this type of event every year. Don�t scream at me, Joe Public, saying �well, you can represent your country for nothing once a year.� Well, it wears on you, especially when you have to go to South Africa to do it. It wears on you � the novelty of the Ryder Cup has been long gone, because of the President�s Cup. And I truly mean that. GTMA: Just one more about last year�s Ryder Cup. 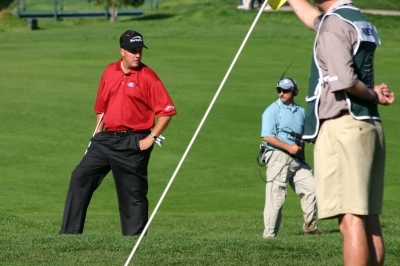 The big controversy that surrounded Hal Sutton�s pairing Tiger and Phil together. Did you consider doing that on your squad? Strange: I was intrigued with Hal�s choice, just like everyone else. I thought a lot about doing it, but there were two reasons why I didn�t. One is because the dynamics of my team wouldn�t really allow it � I always had Toms and Mickelson together, and I always liked Tiger with some other people. If I put those two together, yes, I might have one �super� team, but what does it do to the rest of my team? That said -- I was always scared to death, if I put �em together, what if they lost? What would it do to our team mentally, and what would it do for their confidence as individual players? GTMA: Then to have them lose twice in one day. Strange: I�m not second-guessing Hal, and I�m not saying after the fact � I�m on record saying that I just can�t do it (meaning, put them together). The fact is, neither one played very well last year. I was out there watching �em on the first day, and they just didn�t play very well. GTMA: Is there too much being made about how Tiger and Phil don�t really like each other � in order to kind of �fuel� the rivalry? Strange: Well, there�s respect between them. They�re very cordial to each other, they say the right things. They remind me a lot of Palmer & Nicklaus in their day. Did Palmer and Nicklaus go to dinner together? No. None of the great players went to dinner together. And they were all different people, just like Tiger and Phil. And they wanted to beat each others� butts. If they didn�t, they wouldn�t have been in their positions to start with. So, it�s just the way of today�s times, and the press and the build-up. Phil and Tiger are so different, and so be it. GTMA: Phil�s seemed to have narrowed the gap between them. Do you think the fact that he�s been working with Rick Smith and Dave Pelz has accounted for the difference in his level of play and success? Strange: I think Dave Pelz has done more for Phil Mickelson than anybody else on the face of the earth. That�s not to say Rick Smith hasn�t helped, but Phil looks like he swings the same and I just think Dave Pelz has got him more focused on things that Phil can really work with. Phil Mickelson surveys a short shot at the World Match Play. It's probably one where Dave Pelz helped him decide how to play it. Photo by David Vier. 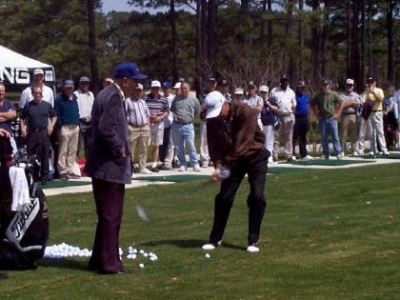 And Dave Pelz doesn�t tell you how to play, he puts numbers in front of you. Basically, Pelz has got Phil working from a hundred yards and in, and he�s practicing hard, and I think it�s wonderful. It�s great, because we don�t stress the short game enough. Any golfer at any level at any talent � we don�t stress from a hundred yards and in enough, because that�s the way for your guy at the club to improve overnight -- to get a bunker lesson, or a chipping lesson. But you never see average guys practice those things. 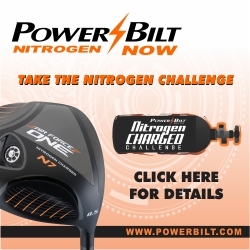 You�re never going to improve from tee to green. The guy with a 10 handicap or a 2 handicap or a 20 handicap � he is what he is. He�s never going to improve his tee shots, he�s never going to improve his long irons, or anything. Where he can improve is around the greens. I mean think about it, it�s true. I�ve come to the realization of that, after 50 friggin� years (laughs). GTMA: All the big guns blast it all over the place, then use their distance advantage to play shorter to the greens. That�s the professional game in 2005. The top four (Woods, Mickelson, Els and Singh) players are all tremendous, and it�s hard to put one in front of the other when you�re talking about who�s playing better. I still think Ernie Els, physically, is potentially the guy who can really rival Tiger. I just wonder whether he wants it enough. Is he mean enough? Vijay is, and I just think the world of his game and his work ethic. When talking about those four, we�re very, very lucky to have this right now � it�s better than the old �big three� (Palmer, Nicklaus & Player). Not only are these guys good, they�re so much more dominant than the next guys, because they do it every single week. Look at Vijay�s record last year � he won nine times, but even when he didn�t, he still finished in the top five every time. 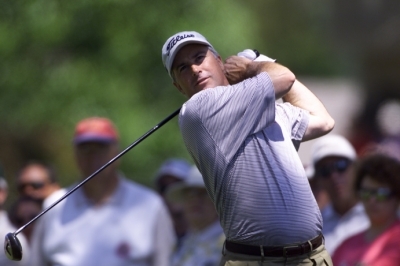 Someone like David Toms is a world-class player, but he doesn�t do it every single week. GTMA: It�s fun to watch. Last but not least, now that you�ve moved to the Champions Tour, what do you see as the major differences between the senior circuit and the PGA Tour? Strange says Vijay Singh's work ethic is unbelievable. It's what's helped him stay on top a couple years into his forties. Photo by David Vier. Go to a place like the Players Championship, and take a look at the atmosphere there... and the people. I call it �the circus� and that�s really the wrong word for it, but it is. There�s something going on in every corner, the players are excited, there�s just the element of big-time golf. When you go to the Champions Tour, it�s� hey, this is no knock, but it is a different atmosphere. It�s an atmosphere that I�m going to thoroughly enjoy I think, because I�m fifty. It�s a sleepy, relaxed atmosphere. It�s not the same. When you think about it, it�s a bunch of older guys, playing in their age group. It is what it is, and I�m a big supporter of the Senior Tour now, just because I�ve got a taste of it, and I really like what it is. But, let�s not kid ourselves, the �show� is on the PGA Tour every week. We are not the show anymore. GTMA: Do you see yourself playing much at all on the regular Tour? Strange: (Emphatically) No. Not at all. I�m not exempt to start with. I could play in a couple tournaments, because I am exempt for a couple, but there�s no reason to. I�m going to commit to playing about 20 events (on the Champions Tour) this year and just see how I do out there. 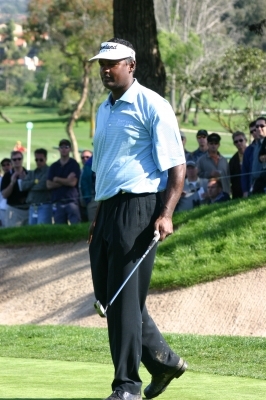 I�ve had my time on the PGA Tour, and it�s time for somebody else to have it. That�s the way I look at it. It�s time to just go and do something else. I certainly love watching it and love the guys, and that was a big part of TV � you get to stay up with the young guys, because you had to. And I�ll still follow it. GTMA: Do you ever see yourself going back to TV? Strange: I always keep my eyes and ears open. I would entertain any offers. But, you know, there�s been nothing, and I certainly understand that -- the longer you�re out of it, the more you become �ancient history� and there�s a new crop of name players who might want to do TV. There may always be someone new, but after eight years on the air, we came to enjoy Strange�s unique style � a guy who can be blunt at times but also more than willing to give a player the benefit of the doubt in a rough situation. Whether he comes back to TV or not, we�ll still be able to see him on the links on the Champions Tour � and hopefully, hoisting a trophy again real soon.